The piggy that went to market – My nine-year-old granddaughter had a big toe tumor removed this past week. I always feel badly when children have surgery. It’s scary. I remember when I had my tonsils taken out at age 11. They kept me overnight and no one could stay with me. I was terrified. Today most things are out-patient and if not, a parent can stay. I hear she is high on pain meds and in good spirits. Here’s hoping for a fast recovery. Signs of aging – In the next two weeks the beloved husband and I have a total of nine medical appointments and we are healthy. Can you believe that? Some are annual check-ups and some are for testing. Back in the old days (like when I was young) it would take five years to have nine appointments! Frogs are out – After another dreadful winter, the frogs are sunning themselves. They are not mating yet, but I did see them eyeing each other up. Love is in the air. The one time I forgot to put the guide on the clipper. This entry was posted in Aging Gracefully, Humor, Random Five and tagged bad haircuts, children's surgery, frogs, granddaughters, haircuts, medical appointments., memory lapses, ponds, short stories, toe surgery by Kate Crimmins. Bookmark the permalink. showing up an hour early pre-Starbucks? Ouch I feel your pain. Just last week, in a morning-drive-to-work-fog, I wheeled into my favorite on-the-way coffee shop marveling at the abundance of parking spaces. yeah, they’re closed. Permanently. Oh no! They closed one Starbucks here about two years ago and I was worried about mine. This morning there were about 10 cars in the drive through so I went in. It was jammed. There was a group sitting together. They had brought in a cake from a grocery store to celebrate something. I thought that was rude. SB sells food. It’s more expensive but they provide seating and great coffee! I hope your granddaughter is recovering well! It’s hard for a young person to be immobile in any way, so I hope she can still get around! And your husband still lets you cut his hair, huh? He trust you to remember the guide? True love! Skyped with the granddaughter yesterday and although she has her moments (or so her Mom says) she seems to be doing ok. Long road though because it will swell. She’s also a gymnast so you know how that goes. As for my husband, he doesn’t really care about his hair. I’m more convenient. Kate I hope you grand daughter is on the mend surgery is a big thing for a child to go through. I am sure you would cheer her up with all your funny stories. Unfortunately she lives cross country from us but we do our best. I’m sorry to hear about your granddaughter, Kate. I hope she has a speedy recovery. And I bet they have loving on their mind! Frogs are out – After another dreadful winter, the frogs are sunning themselves. They are not mating yet, but I did see them eying each other up. Love is in the air. I also have too many doctors to see. It’s endless. The other day there was a fire at my skin doctors. The alarm went off right when I finished getting dressed. I would have had to go outside in my little paisley johnny-coat. Flames, firemen, the works. Saw a canvas bag that made me think of you. In big letters it said: The day is great, after coffee. I can see you in a little paisley medical number with the open back entertaining the troops so to speak! Could you imagine if I had to go out like that? I meant it about that Band-Aide. Poor kid. She’s in Denver so I can’t actually sign it but maybe virtually. That’s good enough. Here reading Erma Bombeck. It’s like reading you…really. A compliment. She’s was a riot. She was so, so funny. As are you!!! Dear Ms kate. Hats off to each of us…troopers all. 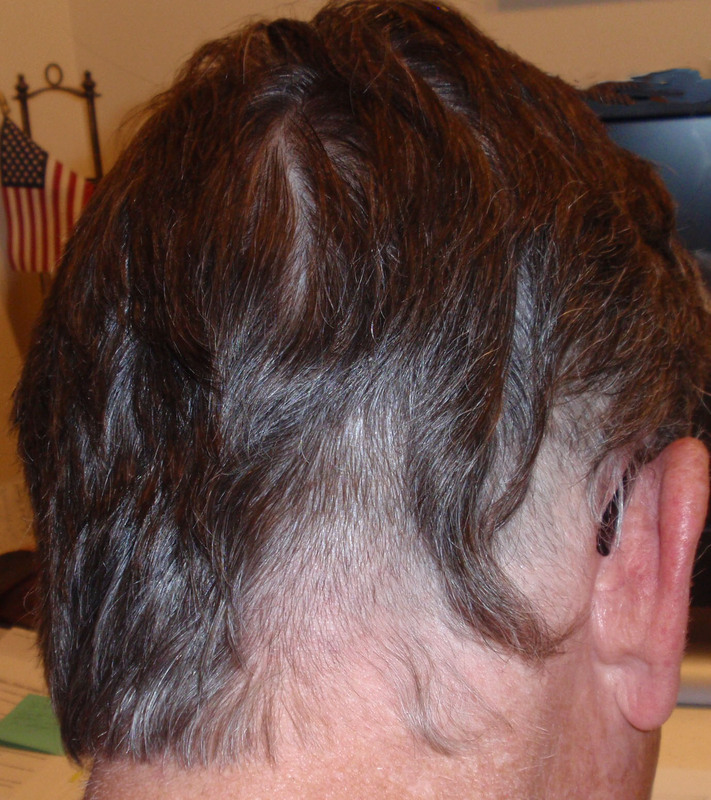 Tumors leave and hair grows back. Hows that for the circle of life. Ha! Travel well. Was glad to hear your tumor was benign too! Woo hoo! Or he just doesn’t care, it’s cheaper and quicker than waiting your turn at a shop. While I don’t enjoy being hospitalized, I always feel worse about young children who can’t understand why they are there instead of at home. Hope your granddaughter rebounds in short order. And good luck with all those appointments. Yes. The good news is that today most things are outpatient. My mother was in the hospital for 5 days when she had a small benign cyst removed from her leg. They kept me for 6 days for my appendectomy! I recover better at home. Kate I think we are living parallel lives. My youngest broke his left arm on April Fools, no joke. Possibly both, but we’ll have to wait for the orthopedic surgeons decision Monday. Long story short he’s a 15 year old musician, or was. Next that was not the only doctor visit we had this week. My wife had three and is now on meds. and that’s too involved so I won’t go there. Then there is me and my thyroid is not right—yep on meds. No coffee for 4 hours after taking the little pill… I think that’s a death sentence. Feeling old? Try ancient, I think lack of caffeine does that to you. Love is in the air here, mosquitoes and they love our blood. My wife usually cuts my hair, but first she was cutting our grandsons hair—whoops! Seeing as she’s under the weather, I chickened out. Off to the barbers with my grandson, taking him in for repairs. Hope your granddaughter is back on her feet soon. And I hope your better. Happy Easter. Wow! This is a parallel universe! Hope your house feels better soon. I would volunteer to cut hair for you but at this point I wouldn’t be any better than your wife. Thank you Kate. I think I’ll veg today, finally some rain will be here. Been a spell, our Sierra Mountains are looking a might dry. We hear about here in the east. We have a drought about a decade ago and it wasn’t fun or pretty. No. We are praying that we can put away electric blankets! Sure hope spring shows up soon for you folks. You’ve had it really bad for so long. I couldn’t do it, I know that. You could if you had no choice. BTW do you have an extra bedroom? Just in case next winter is as bad, I’m lining up warm spots. Why sure. There will be a small fee of course. Nothing extravagant mind you, just enough to help keep up our villa in Monaco. Not a problem….no wait….can I stay at your villa instead? Yeah, me too. I hate doctor’s offices. Oops! I actually forgot the guide with my eyebrows recently! But the BH’s is a bit more dramatic than my mistake. He’ll need to wear a hat to cover! The good part is that he doesn’t care. It’ll grow is his mantra. At this point I am used to looking at this almost buzzed guy. I can’t figure out why they cut it so short. Must have been something he said.